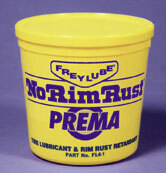 FREYLUBE Prema is a single, ready-to-use multi-purpose product for mounting, dismounting and protection against rust. 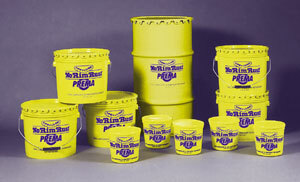 Patented formula contains no water to cause rust or corrosion. Won’t evaporate or harden, ensuring long shelf life. Economical. Costs only pennies per application. Especially formulated for on-highway use where normal conditions exist, typically including class 6-7-8 trucks and buses. 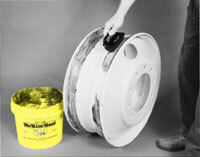 Recommended by fleet owners as well as major tire and wheel manufacturers for use on steel and aluminum wheels. Designed for a wide temperature range (-40°F to 275°F) helping to prevent tires from fusing to rim. Made in USA for over forty years. EZ-ON is the only applicator designed specifically for Freylube NoRimRust which is available in two formulas. The original formula PREMA is ideal for most on-highway uses. SUPRA is used for severe-duty, off-road applications. These are single, ready-to-use, multi-purpose products designed for tire mounting, dismounting and protection of the rim or wheel against rust. Any mounting and dismounting of tires should always be done in accordance with OSHA standards. There are also recommended guidelines that are readily available from the manufacturer of tires and wheels; as well as from many industry associations such as RMA, NTDA, TMC, NWRA. A thin coat of FREYLUBE is then placed sparingly on the interior surfaces of the cleaned rim. This can be applied with something as simple as the EZ-ON Applicator. Install the tire in accordance with the manufacturers recommendations. The best tire lubricant and rim rust retardant you can buy! Notice – Freylube Prema should not be used on farm tractor tires with imported natural rubber. It is recommended that only Freylube Supra be used under those conditions.